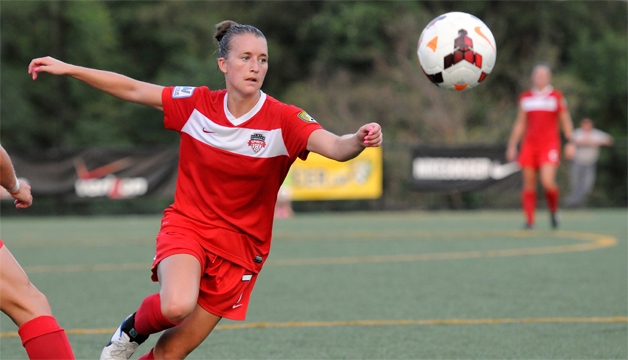 With the first truly oppressive day of summer heat and humidity, the Washington Spirit Reserves outlasted a fit and stingy Braddock Road Stars Elite defense 3-1 before a lively crowd at Howison Homestead Soccer Complex on Wednesday evening. A first half goal by Washington defender Meghan Cox combined with a pair of second half tallies by Kara Wilson and Aaran Parry proved enough to earn the victory on Prince William Soccer Inc. (PWSI) club night in Woodbridge, Virginia. As temperatures climbed into the upper nineties during team warm-ups, both sides found themselves focusing as much on hydrating as they did on the opposing team threats. From the early onset of the match, the Spirit Reserves offense found it difficult to penetrate the solid Braddock Road defensive backline. Washington finally grabbed the initial lead in the 17th minute when forward Ashley Herndon sent a low driven free kick to the deep side of the Stars Elite goal. Crashing forward from her position in the center back, Cox blasted her header firmly into the net for 1-0 advantage that held until half-time. Ten minutes into the second half, the Spirit Reserves doubled their lead on another header, this time from the run of play. Midfielder Katie Yensen managed to beat her defender deep in the right corner and launched the ball across the face of the Braddock Road goal. Teammate Kara Wilson surged forward and struck the ball in full stride to drive the ball past keeper Jessie Ferrari for the 2-0 lead in the 55th minute. Washington substitute Parry seized a golden opportunity in the 69th minute when a careening ball skipped high and out of the Stars Elite box only to fall at her feet. Parry took only a single touch before rifling her shot from twenty yards out untouched into the upper netting for the Spirit Reserves third of the night. Refusing to go quietly, Braddock Road continued its pressure and were finally rewarded in the 78th minute when Stars Elite midfielder Kahla Seymour fed Marissa Park in the Washington box. Parks cut across the full face of the Spirit Reserves goal before planting her shot past keeper Adelaide Gay for the ultimate 3-1 final. Parks remains the only player to score on the Spirit Reserves this season. Her first goal came on May 17th during a 4-1 losing effort against Washington. The victory pushes Washington further ahead in the Northeastern Conference 19 points over the span of 7 games. The New Jersey Wildcats remain in second place, a full three games back from the Spirit Reserves in the standings, but with a game in-hand. The Spirit Reserves remain home this weekend on Saturday, June 21st for a rematch against the New York Magic. Match time is set for 3:00PM at the Maryland SoccerPlex and is the first in a special doubleheader. The NWSL Washington Spirit face the Portland Thorns in the second match of the evening.